This is delightful, Elena. The blue polka dot BG is such an unexpected, cheerful touch. 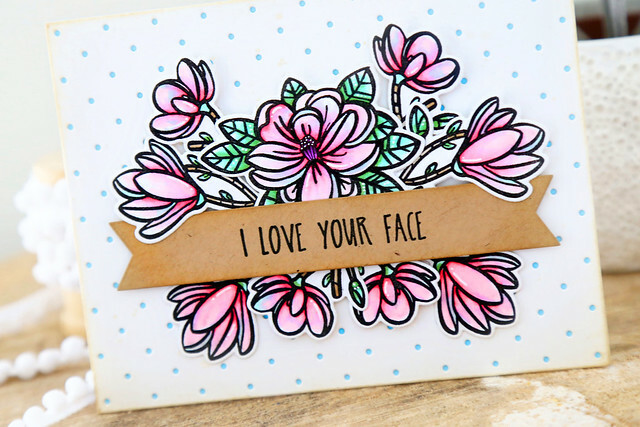 Love your card and that sentiment! Wow! Such a gorgeous card! Beautiful colors! Your card is so pretty and soft! Love how you colored those flowers! So very pretty! Love Magnolias, love this set. sentiment was a great idea. So sweet. I like the sentiment on kraft and the polka dot background. Very pretty card. And that sentiment is awesome, I must get it, lol. Beautiful card and colouring! Love this set! I love the sentiment and great coloring! Love the innocent look of this card. I love how the flowers frame the sentiment banner. Beautiful!! Fabulous way to cluster all of the flowers together, and they definitely do shine! Loving your arrangement of flowers! And that polka dot paper is perfect! Beautiful card! 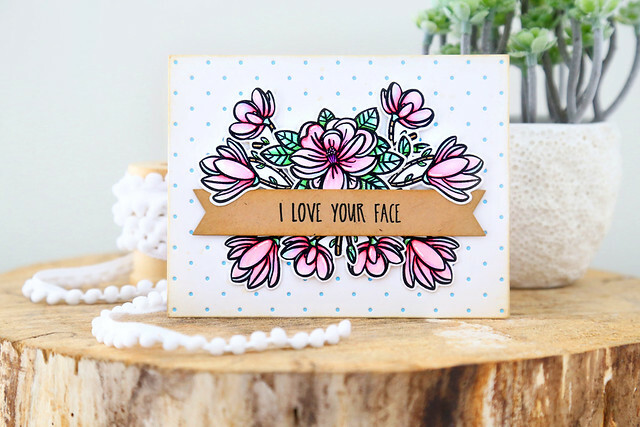 Love the Magnolia set and the dotted paper for your background! That’s such a beautiful floral card ! !